L.V. Harkness is pleased to provide you with a full service stationery department. We would love to work with you in creating your complete wedding suite, from Save the Dates and Wedding Invitations to your “Day Of” Stationery and Thank You notes. To many, the process of picking wedding paper may seem overwhelming, but don’t worry! Our knowledgeable team can help guide you through the process of creating a customized wedding suite to fit any taste or wedding style. We are proud to be an official retailer of Crane and Co. paper goods, offering full lines of Wedding and Social Stationery of the highest quality. Crane & Co. has been a leader in paper since 1801. The brand is often regarded as the top paper retailer in the United States, and treasured for its luxury products by many. Crane paper is well known for being made exclusively from cotton, creating stationery that has a noticeably luxurious finish and substantial feel. We want to make sure L.V. Harkness is a one-stop-shopping experience for all our registered brides, so we couldn’t forget the stationery department! 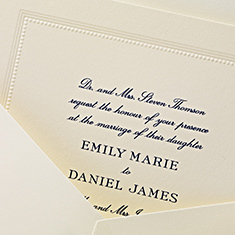 All registered couples will receive 15% OFF their wedding stationery. 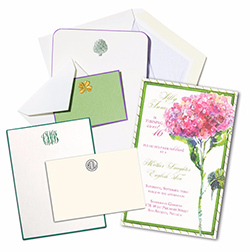 Along with all your Wedding printing necessities, we also have a wide assortment of social stationery, business stationery, and party invitations from vendors such as Oddballs Invitation, The Printery, Dempsey and Carol, Karen Adams, and many more. 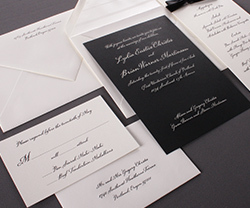 We offer in-house printing of invitations and stationery with a quick turnaround time, and can also fulfill custom orders through Crane. If you can dream it, our team can turn it into a reality!